A warm sunny evening tonight, calm seas and the first summer like feeling here at Langara. 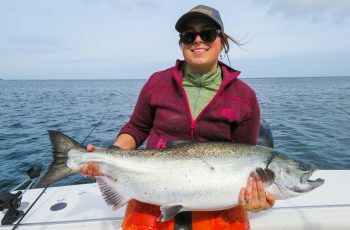 Fishing is now a little better, 26 chinook retained this afternoon, largest a tyee at 36 lbs taken by Tracy Robinson. 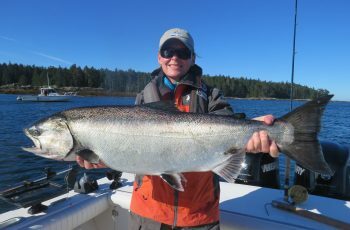 This is Tracy’s first salmon trip, what a start for her. Her guide Mike had her out at Lacy, and not two hours into the afternoon she had her fish, well done. The fleet fished hard out at Lacy, some taking off for the five pm tide change at Coho Point, or what some refer to as Sea Lion point. 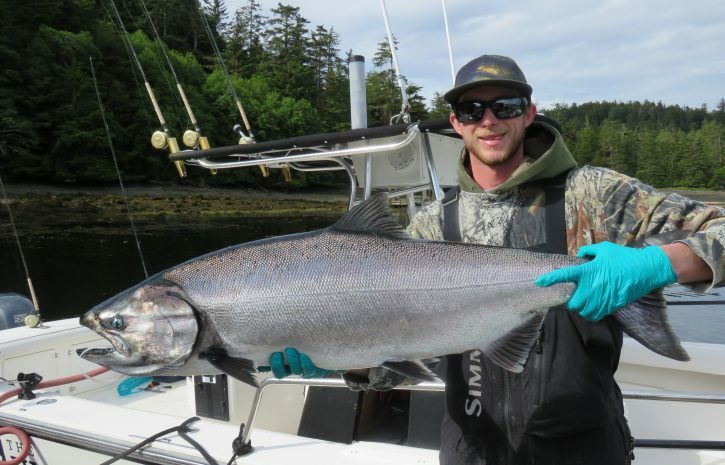 The boys hit a few at Coho, but the majority of the fish wer from out west, some guides dragging 90 on the riggers, in a 170 feet of water. It is a random fish situation, one boat hits three in a row, a boat length away the anglers get nothing. 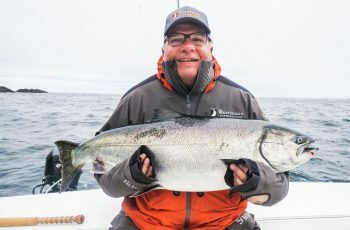 Just as you troll out into the deep, the fish show in on the rock, and a guy can wind up chasing the bite and never catching up. We averaged a couple fish a boat, some boats had a nice bucket, others struggling somewhat. 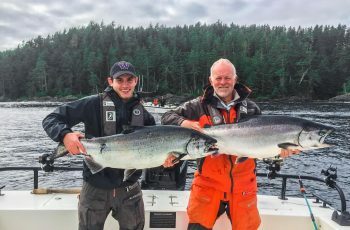 Bud panicked at 4pm and ordered hali bait instead of sandwiches from the candy boat, headed out ten miles , and grabbed a 109 lb halibut. 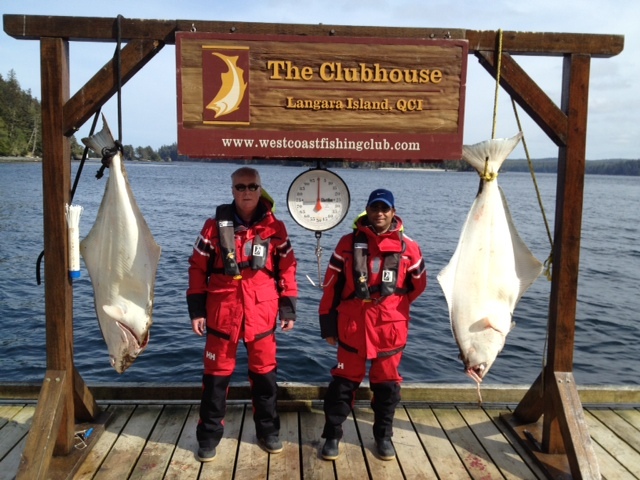 The grin on Buds face when he scores a nice halibut is a bit frightening, but he is happy when the tote is full! 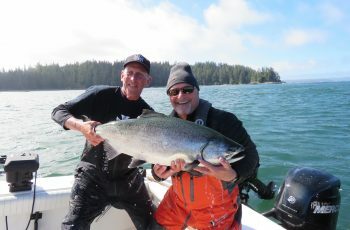 We now have six tyee on the season, a little behind the normal around here, but the weather is spectacular now, seas flat, and the whole island is fishable. For those that want the larger halibut you do need to get out west a few miles and it helps to have a slower tide and a calm sea. For those of us not on fish the weather being warm sunny and so comfortable makes for a great day. I did hear some local scuttlebutt on the squawk box a 46 was taken yesterday at Gunia in the South East gale that blew its self out, winds hit 40 and the pass was ugly for a bit. Also heard of a 39 out at Cape Knox, so a few are swimming around the island, we are patiently waiting for the first 50 of the season. Denis Horgan and Gurpreet Khaira with their beauties! 36 lber yesterday at the dock, 35 lber this am…lots of teeners! 38 lb fish tonight, still sunny and warm, get up here!